Welcome to the third episode of the show! This week, the show will be a little shorter and is all about one topic. If you are going to create your own book, whether you are self-publishing your book for online or local sales, or if you are using it as a business card to help yourself land some business or help a client, or if you just want to be “an author” and don’t really have plans for what you want to do other than sharing your book with the world, then there are 2 basic routes that you can take. The first route is with traditional publishing, and sometimes that will make sense. You won’t get a very high royalty, but what you give up in profit per book sold will be access to editors, cover designers, book designers, typesetters, and (potentially) the marketing arm of your publishing house. Your book will have better distribution than any of the self- or small-publishing options available which can turn into more sales. Even with traditional publishing, you’ll still want to have a hand in the marketing of your book, though, because they aren’t miracle workers. The second route, which I’ll be talking about today, is to self-publish your book, and specifically we will be talking about print on demand. Unlike a decade ago, when you’d have to go with a vanity press that would charge you an arm-and-a-leg for the right to fill your garage with boxes of books that you then have to sell yourself, you can get a book printed for next to nothing or on a relatively small budget, only having to pay for the printing of your books after you’ve made a sale or if you want a small print run for a specific scenario such as to hand out to others or to stock a local book seller. Print on Demand basically means that you can order small quantities of your book which are basically printed on large laser printers. The cost per book is a lot higher than with an offset press, but with offset presses you often have minimum quantities that start in the 2000-5000 copies. Many print on demand companies will also directly tie-in to online (and sometimes offline) retailers so that you never actually have to pay for copies of your book; a customer will buy it, the book will get printed and shipped, and you’ll be paid your royalty with the printing costs already removed. Usually, these companies will also allow you to purchase copies of your books for just the printing costs, which you can then resell by hand or give away. The first two that I want to talk about are CreateSpace and Lightning Source, which are owned by Amazon and by the Ingram Content Group, respectively. Amazon is the largest online retailer in the world, and Ingram is the largest book distributor in the United States. They will also provide you with a free ISBN number, although whether you want to use that or not is a topic for another show. You can only print trade paperbacks with CreateSpace, and the quality is pretty good although it can be inconsistent at times. If Amazon is going to be the primary source of sales for your book, then CreateSpace makes the most sense for where you want to publish it. Lightning Source requires a bit more work. CreateSpace is set up as a business to consumer experience, but Lightning Source only wants to work with actual publishers. You need to have a company, you need to have your own ISBN numbers, and there are more up-front fees for your books and proofs cost quite a bit more than they do at CreateSpace. However, if you want to sell your book in physical bookstores, especially if you don’t want to have to drive yourself there and deliver them by hand, then you will have a lot more luck getting them to order if the books are available in Ingram’s catalog than you would if you tried using CreateSpace’s expanded distribution network. Unlike CreateSpace, where updating your book’s files is free, you will also have to pay to update the cover or the interior files for your books at Lightning Source, so if you like to have multiple physical proofs then you may want to use another company to print those books for you first until you are sure you’ve found as many typos or layout issues as you think you can. Now if Lightning Source is so much more expensive, then why would you want to use them? First, there are more book formats available to you, including hardcover. The books are also more likely to be more consistently of a higher quality with Lightning Source than with CreateSpace, especially for larger books or higher page counts. The customer support is also much higher. Lightning Source used to actually be the company that did all of the printing for CreateSpace around the time that Amazon acquired them, and they still handle overflow when CreateSpace runs out of capacity and needs to have books printed. Both marketplaces can get you listed in Amazon, although for the past year or so as I record this Amazon has stopped listing Lightning Source print on demand books always being in stock in an effort to help encourage people to use CreateSpace. CreateSpace can be a better solution for verifying the proof of concept for a book, making sure that it will sell, and for getting it listed in Amazon. Lightning Source is definitely who you would want to turn to if you wanted national distribution to physical bookstores and a higher quality end product. In fact, you can put your books into both marketplaces, and many successful self-published books are listed in both places. I would probably recommend avoiding Lightning Source if you don’t think you’ll have a large quantity of sales though. Both companies will work just fine if you are going to distribute your book locally, whether that’s through networking events, conferences, or local bookstores where you’ll be delivering the books. If you need a short print run of a few hundred books, though, then a third option that you might consider is 48 Hour Books. 48 Hour Books will not make your book available either online or offline; they are strictly a printing company. Their minimum quantity is 10 books, which probably isn’t worth it if you just need a perfect bound paperback, but around 100 books they are going to be slightly more expensive than using CreateSpace and on par with Lightning Source, and around 400 or 500 books or more they will be a faster and better deal than either of those companies. The books are also a lot more likely to reach you without imperfections as they will print on an offset press and not digitally, even at small quantities. After you upload and approve your files, they’ll ship your books within 2 business days, which means that you’ll have them within 3 days to a week anywhere in the United States. For specialty printing, there are a few other print on demand companies that are worth mentioning. Lulu.com is one that I’ve used in the past for a family cookbook that I had created; the books are more expensive than CreateSpace, but for color printing Lulu will be higher quality. If your margins can handle it, then I’d go with them over CreateSpace for anything in color and would ignore them for anything that is black & white as they don’t really offer much other than higher prices otherwise. You can get your book listed in Amazon’s marketplace from Lulu, but you’ll have to give up a higher royalty than you would with CreateSpace. If you are a photographer and want a beautiful, high quality coffee table book or portfolio book, then you should have a look at Blurb.com. They’re a lot more expensive than just about everybody else, but for graphically-rich projects they can’t be beat. I haven’t personally used them for my own projects as I lean more towards text than photos, but when you really need to show off your work they can create a high quality product in ways that CreateSpace, Lightning Source, and Lulu can’t. There are a lot of other options, but for small quantities of books those are the 5 I’d recommend. If you want to create a full-color, photo rich coffee-table book, then I’d go with Blurb. If you have another project that’s full-color and quality is more important than your royalty or distribution options, then Lulu will serve you well. If you want a large quantity of books printed correctly, you need them fast, and you don’t care about distribution, then you should take a look at 48 hour books. For most people, however, you should use either Lightning Source or CreateSpace. If you aren’t sure which is the better option for your circumstances, then chances are that it is CreateSpace and you should consider starting there until you have a reason to go elsewhere. Hello, and welcome to the third episode of the Modern Publishing Podcast. I’m your host, Blaine Moore. If you’re going to create your own book, whether you’re a self publishing your book for online or local sales, or if you’re using it as a business card to help yourself land some business or help a client, or if you just want to be an author and don’t really have plans for what you want to do other than sharing your book with the world, then there are two basic routes that you can take. The first route is with traditional publishing, and sometimes that will make some sense. You won’t get a very high royalty, but what you give up for in profit per book sold will be access to editors, cover designers, book designers, typesetters, and potentially, the marketing arm of your publishing house. Your book will have better distribution than any of the self- or small-publishing options available which can turn into more sales. But even with traditional publishing, you’ll still want to have a hand in the marketing of your book. They’re not really miracle workers, and most of this is going to fall on the author’s shoulders going forward at this point. 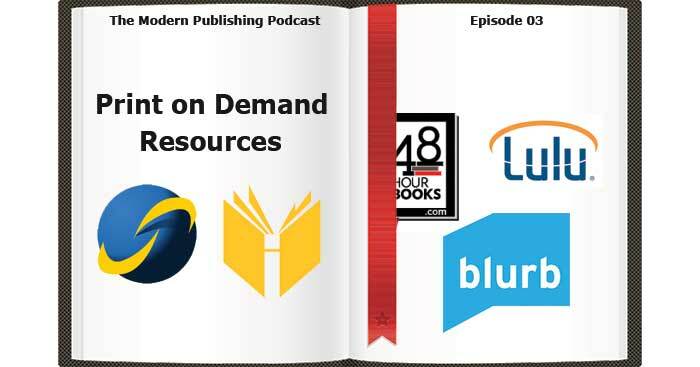 The second route, which I’m going to be talking about today, is to self-publish your book, and specifically, we are going to talk about print on demand. Unlike a decade ago, when you’d have to go with a vanity press that would charge you an arm and a leg for the right to fill your garage with boxes of books that you then have to sell yourself, you can get a book printed for next to nothing or on a relatively small budget, only having to pay for the printing of your books after you’ve made a sale or if you want a small print run for a specific scenario such as handing out books to others or stocking a local book seller. Print on Demand basically means that you can order small quantities of your book which are printed on large laser printers. The cost per book is a lot higher than with an offset press, but with offset presses you often have minimum quantities that start in the 2,000 to 5,000 quantities, and that’s how you get your cost per book down so low. Now, when you’re getting that many quantities, you also, of course, need to have somewhere to store those books and you have to figure out what you’re going to do with them once you have them. Many print-on-demand companies also tie in directly to the online (and sometimes to the offline) retailers, so that you never actually have to pay for the copies of your book. A customer will buy it, the book will get printed and shipped, and you’ll be paid your royalty with the printing costs already removed. Usually, these companies will also allow you to purchase copies of your books for just the printing costs, which you can then resell by hand or give away. There are companies located around the world that can handle print on demand, but I am going to talk about five of them today and when you might choose one of them over another, especially if you live in the United States. The first two that I want to talk about are CreateSpace and Lightning Source, which are owned by Amazon and by the Ingram Content Group respectively. Amazon is the largest online retailer in the world, and Ingram is the largest book distributor in the United States. CreateSpace provides the easiest way to get a book into Amazon’s marketplace, and if you only have one or two books, maybe up to a half dozen, it will be the most economical option as you can get your books listed for no upfront fees and just some sweat equity. They do offer author services such as design and editing, and they’ll try to encourage you to purchase those services as you go along. But if you hire your own editor or designer, or you do it yourself, then you can upload the files directly and don’t have to pay CreateSpace anything until after you sell a copy of your book. Well, technically, the first time you sell a book through CreateSpace, you also need to purchase a physical proof, but you’ll be wanting a copy of your book anyway and you only have to pay the printing costs and shipping. CreateSpace will also provide you with a free ISBN number, although whether you want to use that or not is a topic for another show. You can only print trade paperbacks with CreateSpace, and the quality is pretty good although it can be inconsistent at times. If Amazon is going to be the primary source of sales for your book, then CreateSpace makes the most sense for where you want to publish it. Lightning Source requires a bit more work. CreateSpace is set up as a business-to-consumer experience, but Lightning Source only wants to work with the actual publishers. You need to have a company, you need to have your own ISBN numbers, and there are more upfront fees for your books and proofs which costs quite a bit more than they do at CreateSpace. However, if you want to sell your book in physical bookstores, especially if you don’t want to have to drive yourself there and deliver them by hand, then you will have a lot more luck getting them to order if the books are available in Ingram’s catalog than you would if you tried using CreateSpace’s expanded distribution network. Unlike CreateSpace, where updating your book’s files are free, you will also have to pay to update the cover or the interior files for your books at Lightning Source. So if you like to have multiple physical proofs, then you may want to use another company to print those books for you first until you are sure you’ve found as many typos or layout issues as you think you can. Now, if Lightning Source is so much more expensive, then why would you want to use them? First, there are more book formats that are available to you, including hardcover. The books are also more likely to be more consistently of a higher quality with Lightning Source than with CreateSpace, especially for larger books or higher page counts. The customer support is also much better. Lightning Source used to actually be the company that did all of the printing for CreateSpace around the time that Amazon acquired them, and they still handle overflow when CreateSpace runs out of capacity and needs to have more books printed. Both marketplaces can get you listed in Amazon, although for the past year or so as I record this, Amazon stopped listing Lightning Source print-on-demand books as always being in stock in an effort to help encourage people to using CreateSpace instead. CreateSpace can be a better solution for verifying the proof of concept for a book, making sure that it will sell, and for getting it listed in Amazon. Lightning Source is definitely who you would want to turn to if you wanted national distribution to physical bookstores and higher quality end product. In fact, you can put your books into both marketplaces, and many successful self-published books are listed in both places. I would probably recommend avoiding Lightning Source if you don’t think you’ll have a large quantity of sales though. Both companies will work just fine if you are going to distribute your book locally, whether that’s through networking events, conferences, local bookstores where you’ll be delivering the books, or anything like that. If you need to print a short run of a few hundred books though, then a third option that you might consider is 48 Hour Books, as 48 Hour Books will not make your book available either online or offline. They are strictly a printing company. Their minimum quantity is 10 books, which probably isn’t worth it if you just need a perfect bound paperback, but around 100 books they are going to be slightly more expensive than using CreateSpace and on par with Lightning Source, and around 400 to 500 books or anything that’s higher than that, then they will be a faster and better deal than either of those companies. The books are also a lot more likely to reach you without imperfections as they print on an offset press and not digitally, even at small quantities, and have a better shipping process. After you upload and approve your files, they’ll ship your books within two business days, which means that you’ll have them within three days to a week anywhere in the United States. For specialty printing, there are a few other print-on-demand companies that are worth mentioning. Lulu.com is one that I’ve used in the past for a family cookbook that I had created, and the books are more expensive than CreateSpace, but for color printing Lulu is going to be higher quality. If your margins can handle it, then I’d go with them over CreateSpace for anything that’s in color and I would ignore them for anything that is black and white as they don’t really offer much other than higher prices otherwise. You can get your book listed in Amazon’s marketplace from Lulu, but you’ll have to give up a higher royalty than you would if you’re printing through CreateSpace. If you are a photographer and you want a beautiful, high quality coffee table book or portfolio book, then you should have a look at Blurb.com. They’re a lot more expensive than just about everybody else, but for graphically-rich projects, they can’t be beat. I haven’t personally used them for my own projects as I lean more towards text than photos, but when you really need to show off your work, they can create a high-quality book in ways that CreateSpace, Lightning Source, and Lulu can’t. There are a lot of other options, as I said earlier, and for small quantities of books, these are the five that I would recommend. If you want to create a full-color, photo-rich coffee table book, then I’d go with Blurb. If you have another project that full color and quality is more important than your royalty or your distribution options, then Lulu will serve you well. If you want a large quantity of books printed correctly, you need them fast, and you don’t care about distribution, then you should take a look at 48 Hour Books. For most people, however, you should use either Lightning Source or CreateSpace. If you aren’t sure which is the better option for your circumstances, then chances are that it’s going to be CreateSpace and you should consider starting there unless you have a reason to go elsewhere. You can find links to all of these sites on the show notes for this episode, which is at ModernPublishingPodcast.com/3. In the future, we’ll talk about how you can distribute your books digitally as that’s becoming a very big market and something that you’ll definitely want to consider, and we’ll also speak with people who have had their books sold either digitally or physically and what their experience is like and what options that they’ve used. So until next time, this is Blaine Moore at the Modern Publishing Podcast, and I’m looking forward to talking to you again.